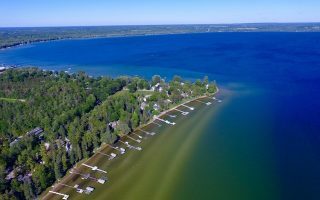 The Lake Michigan Coast from Grand Traverse Bay to Mackinaw City is considered one of the most scenic locations in the midwest, with giant rolling sand dunes, colorful cherry orchards, and shady hardwood forests bordering endless vistas of the Great Lakes. 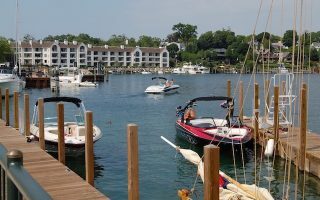 While none of the cities in this part of Michigan’s peninsula are very large, they are some of the top tourist destinations in the state, from Traverse City, to Mackinaw City, to the idyllic Mackinac Island. 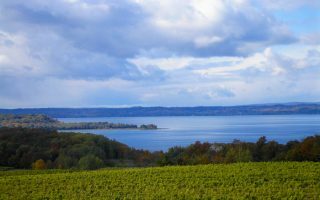 Our guide to running in Traverse City and vicinity is laid out a bit by geography, with several routes concentrated in and around Traverse City and then some of the best spots along the Lake Michigan coast, and then north toward Mackinaw City and Mackinack Island. Running in this park of Michigan’s lower peninsula is offers a great variety. 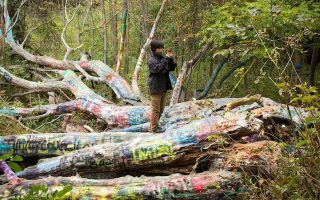 An enormous network of multi-use paths (mostly part of the TART) flows through towns, state forests, and even parts of the National Lakeshore, attracting runners of all stripes and abilities. 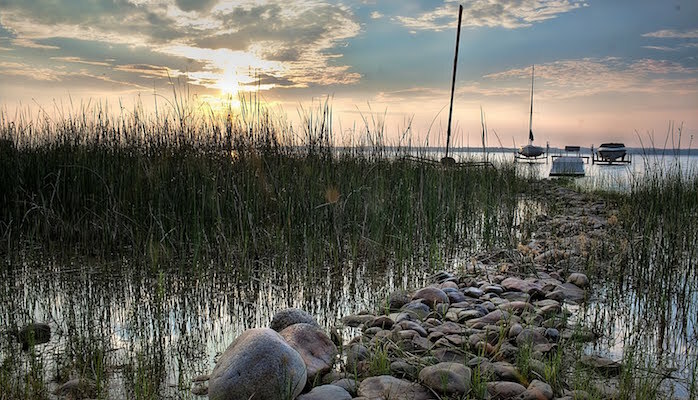 Casual trail runners will delight in the paths around Lake Ann, Vasa, Sleeping Bear Dunes, Arcadia Dunes, and the Village at Grand Traverse Commons, while road runners will love exploring Old Mission Peninsula and Front Street in downtown Traverse City. For a special destination run, complete the 8 mile (car free!) loop around beautiful Mackinac Island. If you plan on traveling the whole of the north lower peninsula, a car is needed. For those sticking close to Traverse City, the BATA Bus System is cheap and efficient. Note that a ferry is required to get to Mackinack Island. The cornerstone of the massive TART network, this 10.5 mile multi-use trail cuts across downtown Traverse City with great views of the West Bay. We’ve mapped a 5 mile out and back along the most scenic section, with an add-on along the Boardman Lake Trail. 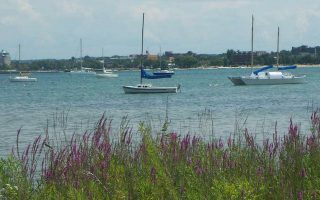 Traverse City’s long peninsula, which juts into Grand Traverse Bay, is a beautiful spot for a road run along the waterfront. Choose from East Shore Drive and Bluff Road on the east side, or Peninsula Drive on the west side. These former hospital grounds turned public activity and recreation area have 140 acres of unpaved trails behind Building 50. Runners can create a DIY route of about 2.5 miles on these wooded paths. 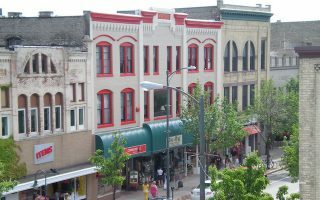 This main strip through downtown Traverse City includes a festive row of shops, restaurants, and galleries. Start in Slab Town and make your way east towards Old Mission Peninsula. 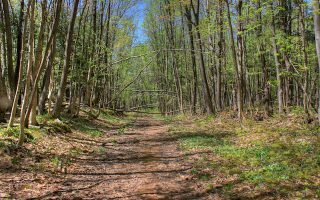 This well-groomed dirt doubletrack through Michigan State Forest has 3k, 5k, 10k, or 25k loop options, all starting from the same trailhead in Williamsburg. Good trail running options for multiple abilities. Quiet wilderness trails around Lake Ann and the Platte River. 3.4 mile and 5-mile circuit options start from the trailhead off Reynolds Road. 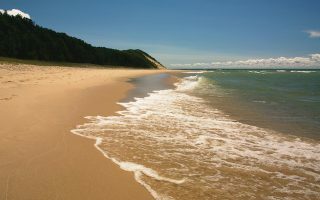 The incredibly scenic Sleeping Bear Dunes National Lakeshore is a don’t miss destination. Out of the many trails here, the best for running is the Sleeping Bear Heritage Trail. We’ve mapped 5 miles out of the 20 mile multi-use path. 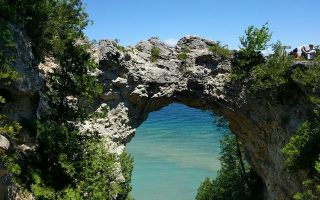 The 8-mile loop run along the shores of car-free Mackinac Island is a must-do, passing beautiful lake vistas, rock formations, and historic buildings of the port area. Accessible by ferry from Mackinaw City. Lots of interior trails on the island as well. 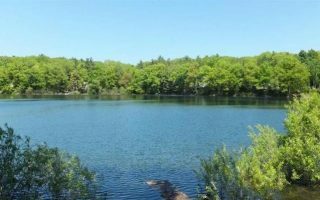 Quiet lakeside nature preserve with shady forests and trails through the dunes. 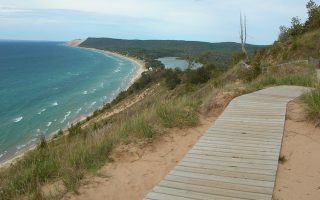 The best locations for a run are the paths from Green Point Dunes to the Beach and the Overlook Trail at Arcadia Dunes. Home to the Charlevoix Half/Full Marathon, this paved, multi-use path runs for 26 miles between Charlevoix and Harbor Springs. The most scenic section is the ~3 miles along Little Traverse Bay from Michigan Shores State Park past the Loeb Nature Preserve. A 61-mile asphalt trail from Gaylord to Mackinaw City. The best sections for running are around Mullett Lake and the Sturgeon River. See detailed trail map with segment distances. 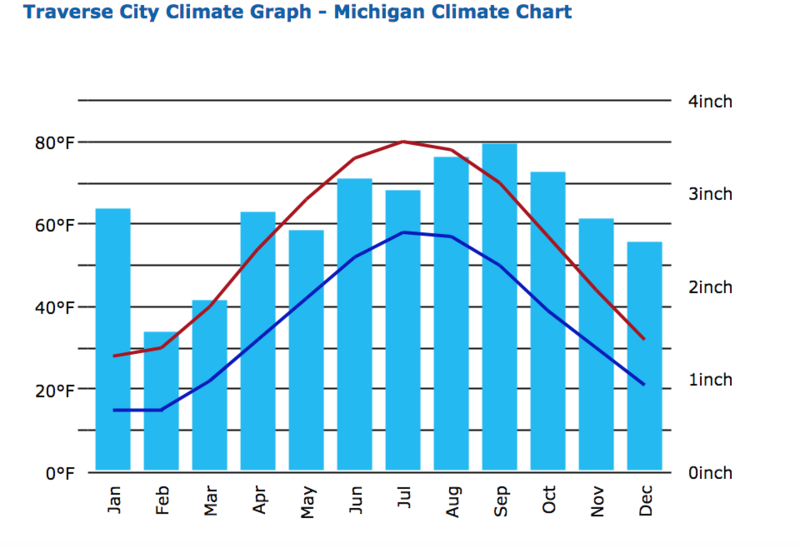 This area of Michigan has cold, snowy winters and warm, fairly sunny summers. Average summer high temperatures are around 80F (26C), though nights can cool off — you might need a layer even in July! Fall is crisp, beautiful, and short. Runners visiting the area in winter should be prepared for cold temperatures, with daily highs in the high 20s (-4C) and lows in the teens. Snowfall is abundant, averaging 100 inches annually. So you’ll need proper winter gear. This is a popular vacation area in summer, so there’s a good variety of hotels. Our running routes for this area cover a fairly large geography. But for Traverse City, if you’d prefer to step out your door and go for a run, try to stay within a mile or two of our recommended routes, especially in the downtown section near West Bay. For tourism info, see: TraverseCity.com. Running Fit has two locations in downtown and south Traverse City, and they are incredibly helpful with gear and route planning advice! GROUP RUNS. Check out Run Traverse City and the TC Track Club. The Traverse City Track Club has group runs Monday nights. See RunMichigan’s calendar for upcoming events.